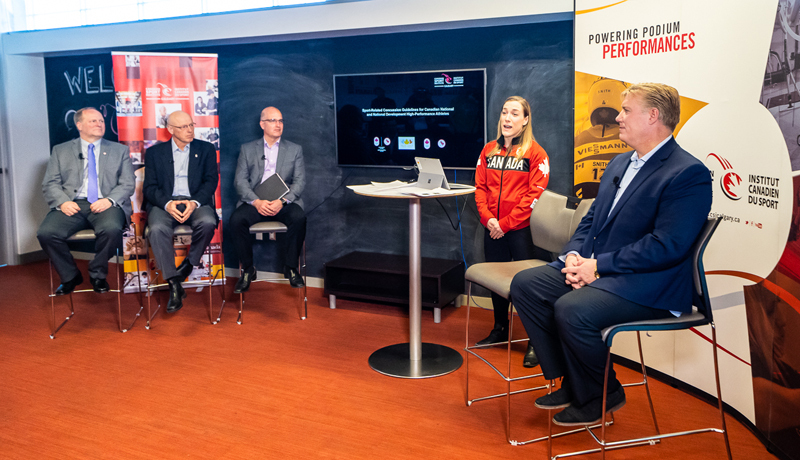 Canada’s high performance sport community has announced national sport-related concussion guidelines designed to protect its national and next generation athletes. Concussion Definition – Sport-related concussion is defined as a traumatic brain injury induced by biomechanical forces. There are several common features that may be utilized in clinically defining the nature of a concussive head injury. Sport Concussion Policy, Protocol and Education – All high-risk Olympic and Paralympic winter and summer National Sport Organizations must have an up-to-date sport concussion policy and protocol in place that specifically addresses concussion education/awareness, code of conduct, removal from sport and return to sport. Pre-season Clinical Assessment (healthy, uninjured) – During the pre-season period and prior to the first day of competitive season training camp, it is suggested that all high-risk sport athletes complete various clinical assessments under the supervision and guidance of the team physician at the time of COPSI Network Comprehensive Athlete Medical Intake on an annual basis. Concussion Recognition and Removal from Sport Participation for Medical Evaluation – If a concussion is suspected, the athlete must be removed from training or competition and evaluated immediately. It is recommended that a COPSI Network, COC or CPC team certified athletic therapist, physiotherapist, chiropractor or physician be onsite during practice, training and competition. a. Clinical Assessment and Management – (1) Concussion is a clinical diagnosis with the aid of a comprehensive clinical history, including mechanism of injury and previous injury history, and detailed neurological examination as soon as possible following the injury by the team physician or a physician experience with sport concussion. (2) If a concussion is formally diagnosed, both physical and cognitive rest is advised for the initial 24-48 hours post-concussion. (3) After 24-48 hours of relative rest, athletes can be encouraged to become gradually and progressively more active while staying below their cognitive and physical symptom-exacerbation thresholds. (4) When the athlete is determined by the medical team to be free of concussion-related symptoms at rest and with exertion, it is suggested the athlete repeat the web-based cognitive/neuropsychological test for post-concussion evaluation. b. Return to Sport (Unrestricted Training and/or Competition) – It is recommended that athletes return to unrestricted training and competition only after the following circumstances have occurred: (1) There is resolution of concussion-related symptoms at rest. (2) There is no recurrence of concussion-related symptoms at exertion levels required for unrestricted practice and competition. (3) The athlete’s post-concussion clinical and neuropsychological status has returned to individual baseline levels as judged by the team physician. c. Persistent Symptoms – Approximately 15-30% of patients will experience persistent symptoms. It is suggested that treatment be individualized and targeted to specific medical, physical and psychosocial factors identified on multidisciplinary assessments. d. Sideline Assessment – If an athlete is suspected of sustaining a severe head or spine injury during a game or practice, an ambulance must be called immediately to transfer the patient to the nearest emergency department for further medical assessment. If there is no concern for a more serious head or spine injury and after the first aid issues have been addressed, all suspected cases of concussion must be removed from the playing field and assessed by the medical team in a distraction-free environment.